Look out, world! I've got another story out! This one co-written with my lovely wife, Emily! It's called “Plan 9 in Outer Space,” not be be confused with Plan 9 FROM Outer Space. It's a tribute to Ed Wood, “unappreciated Renaissance Man of the Twentieth Century,” as the tale's hero puts it. Don't you love the way it looks like an old pulp magazine? 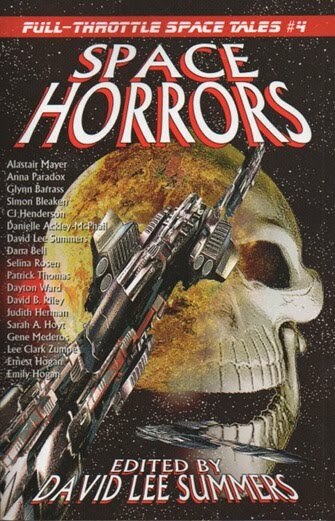 Space Horrors: Full-Throttle Space Tales #4, was edited by David Lee Summers. It's an anthology of bone-chillers set in the cosmic void in the grand tradition of movies like Alien, It! The Terror from Beyond Space, Angry Red Planet, Demon Planet, and in my case, inspired by Plan 9 from Outer Space. If you are looking for a cozy, germ-free, spaceship environment that allows you to escape from the horrors of contemporary life – this ain't it! “Plan 9 in Outer Space” asks the question: Can a man who wants to be another Ed Wood find happiness on a spaceship full of zombies? The answer is hilarious and disturbing. So order your copy now, for this and a whole book of stories that will give you space-bound nightmares! And there's no escape – because space in all around us. Bwhahahahahaha . . .